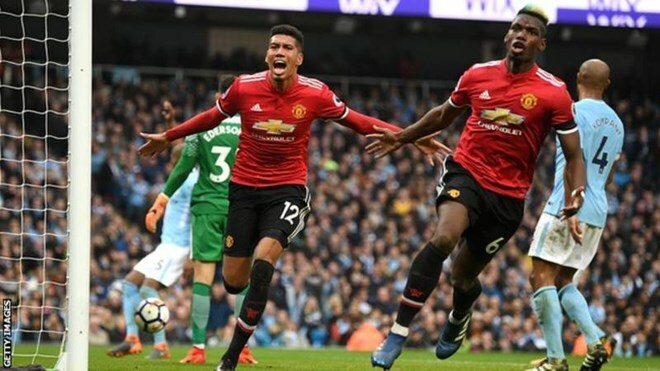 But City, who would have been crowned champions with victory, will have to wait as second-placed United narrowed the gap to 13 points ensuring there were no celebrations on derby day. newsupdateAnd the hosts should have been away after a blistering opening period saw them tear United apart and hold a comfortable lead going into the second half. Bernardo Silva was inches away from poking home shortly afterwards but he failed to get enough on the ball to beat the outstretched leg of David de Gea. Kompany then made no mistake when he leapt highest and beat Smalling to head home from a corner and give City a deserved lead, before Gundogan turned away from Smalling in the box to make it 2-0. That was not the end of the drama though as substitute Sergio Aguero had a strong claim for a penalty turned down after a challenge by Young moments before players from both sides clashed on the pitch as tensions boiled over. De Gea then pulled off a sensational save in the 89th minute to deny Aguero a late equaliser before Sterling saw the ball ricochet off his hip and almost squeeze in before the keeper palmed it away.